Home The Economy Controls Orange is the new Black-Market Deterrent. Orange is the new Black-Market Deterrent. “I’m a bachaquero and I want to change”. Easier said than done. There’s no doubt about it: The central government has a huge “bachaquero” problem, that is, thousands of people buying regulated goods and reselling them at black market prices to make ends meet. Instead of attacking the roots of this problem, that is, the spectacular price distortions that make waiting in line one of the most lucrative jobs this side of drug-dealing, Nicolas Maduro thinks that an upcoming “wipe-bachaqueo-out” plan (similar to his current crackdown-on-crime plan) will do the trick. 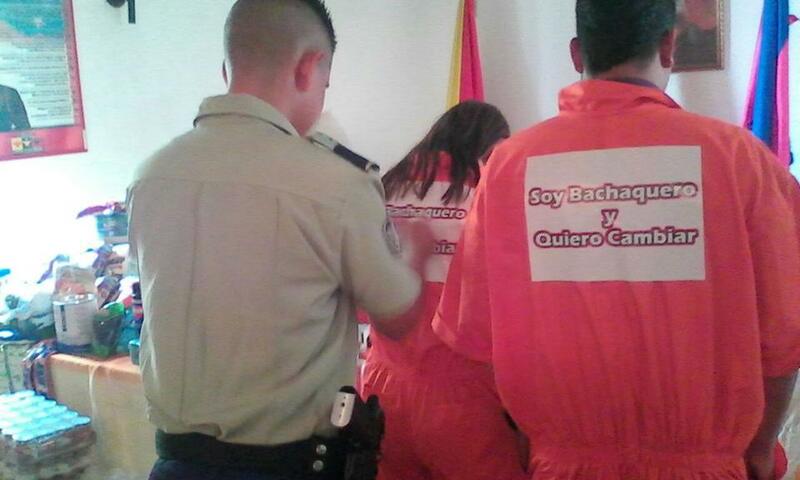 Juan Carlos Sánchez, mayor of La Victoria (Aragua State) started applying his “Cero Bachaqueo” policy earlier this month, which includes “moral sanctions” against those detained by the local police: Dressing perpetrators in orange jumpsuits (similar to those used in prisons) branded with with the phrase “I’m a bachaquero and I want to change” (Soy bachaquero y quiero cambiar) across the back. As punishment, they are made to clean up the streets of the town. Sánchez´s plan got the attention of human rights NGO Provea, which pointed out that that local mayors have no legal power to impose such punitive actions, since, in fact, only the Judiciary does. In a series of tweets, Provea asked People’s Ombudsman Tarek William Saab to intervene in the case. Surprisingly, William Saab agreed with Provea’s stance and prompted mayors to stop what he considers a “humiliation”. It remains to be seen whether this announcement results in concrete actions. Especially because another mayor has already followed Sánchez´s steps: Puerto Cabello’s (Carabobo State) Rafael Lacava joined the bandwagon (with his own version of the orange jumpsuit included) and says that the plan has already produced good results. Lacava even shared details on his Twitter account of their biggest sting so far, the detention of a woman who sold diapers through social networks (a lady Lacava refers to as the “bachaquera 2.0.”). As for Lacava´s opinion of William Saab’s cease-and-desist request? He doesn’t like it. Check out the tweets below. No translation is needed. Q arrecher….!!!!!! Q hago entonces? Me siento a ver como roban al pueblo d PtoCabello de manera impune?No jod… Yo lo q voy es palante!!! Even if such moves are public relations panaceas that avoid the core of the problem, the standoff between Chavista mayors and the central government does pose an interesting thought experiment about decentralization. It is rare to see public officials on the same side of the political divide at odds with each other, and challenging one of the very institutions that Chavismo has worked so hard to destroy: separation of powers between levels of government. Bachaquero-shaming will not eradicate the black market of consumer goods, nor will it deal with long supermarket queues that have become our daily slice of life. But it has certainly proven an effective headline grabber for those who promote it. And in this electoral year free-for-all, it wouldn’t surprise me if more mayors got behind sensationalist measures like this one. Because, yes, all publicity is good publicity, but its even better when it serves to distract Venezuelans from questioning the true roots of the problem. And they’re already proving me right. Dehumanizing “bachaqueros” is not exactly the best way to deal with them… verdad, Diosdado?